Running back Darrell Scott just finished up his Junior season at the University of South Florida (USF). He tallied 814 yards and racked up 6 touchdowns (4 against Florida A&M alone) this past season. 2011 was his only season with the USF Bulls. He had transferred from Colorado after the 2009 season. 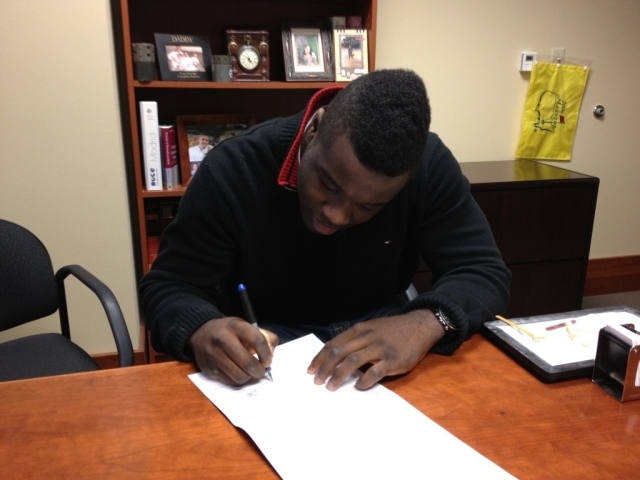 Scott recently decided that he will forego his Senior season and enter his name into the 2012 NFL Draft. While I am not sure where Scott will be selected, I applaud him for first going through the NFL draft advisory board process and getting his draft grade. I doubt that he would have entered his name into the draft if he was displeased with the advisory board’s projection. Scott has also signed with MB Sports to assist him through the process of getting ready for the draft and hopefully hearing his name on one of the draft days. Michael Ballard, Esq. is the owner and NFLPA certified contract advisor at MB Sports. The company started last year and is based in Salt Lake City, Utah. The image at the top of this post is of Scott signing his SRA and listing Michael Ballard as his Contract Advisor.